We have prepared a selection of hotels located in Santiago to provide you with different accommodation options for you to choose from. Main information of each hotel is displayed in the next table. Below, you may also find a brief description of each one of the hotels, along with some pictures. Av. Ricardo Lyon 207, Providencia. 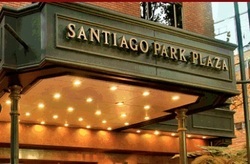 Situated in the heart of Providencia, Santiago Park Plaza is a prime location. Close to the Los Leones Metro station, to travel agencies, tourist offices, exchange houses, banks and with direct access to the main commercial, tourist and cultural city of Santiago de Chile. Located 30 min. from venue. This room features: King size bed, mini-bar, cable TV, Wi-Fi, safe, private bathroom, air conditioning, radio clock with accessory connections (iPods, mp3 and mp4 players), telephone with national and international direct dial and hair dryer. Includes buffet breakfast. In walking distance of legendary sites including Pablo Neruda’s house, Parque Metropolitano Zoo, San Cristóbal Hill, the district’s best shopping, restaurants, and pubs, Sheraton Santiago Hotel and Convention Center is also just 12 minutes from the airport and an easy drive from Viña del Mar, world-class ski centers, lakes and mountains. Located 40 min. from venue. All rooms have been recently refashioned and are more comfortable and spacious than ever. Each is equipped with a 32” plasma TV, The Sheraton Sweet Sleeper™ Bed, laptop-sized safety deposit boxes, and High Speed Internet Access with plug and play connections. Visit hotel web page for amenities availability and extra costs. Av. Libertador Bernardo O’Higgins 1485, Santiago. Diego de Almagro Hotel is located in Santiago’s civic area. It was designed to conserve Rivas Palace, a national monument, and to comfortably accommodate customers travelling for either business or leisure. Our acclimatize rooms with soundproof windows, finely decorated, enable you to have the rest that you deserve. The cost of the room includes an American breakfast buffet. Visit hotel web page for amenities availability and extra night cost. Principado de Asturias Hotel, is a business project that is considered one of the principal hotel alternatives both nationally and international. It was built as a truly superior four star hotel ,with the highest standards in order to totally satisfy our guests. Located 20 min. from venue. Av. Miguel Claro 425, Providencia. 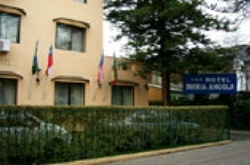 Maria Angola Hotel, is part of Diego de Almagro Hotels Chain, it is located near to of the most important Santiago Avenues: Providencia Av. and 11 de Septiembre Av. It is also close to Salvador and Manuel Montt Metro stations, which will facilitate the displacement to any point of the city. Pío Nono 420, Barrio Bellavista, Santiago. Hotel El Castillo is located in the heart of Barrio Bellavista, a short walk from Baquedano metro station and minutes from the civic center of Santiago. Near El Castillo you may find the Metropolitan Park, the zoo, the Patio Bellavista, Neruda's house, various art galleries, diverse cultural centers and many restaurants with different delicacies. Located 35 min. from venue. Next you will find a selection of Hostels located in downtown Santiago, in three well-known neighbourhoods of the city. 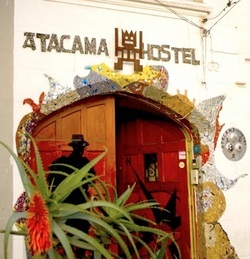 Located in the heart of Santiago, one block from Plaza Brasil, this is one of the most emblematic hostels in the city. Casa Roja offers affordable rates and many amenities. Located 45 min. from venue. Monjitas 506, Barrio Bellas Artes, Santiago. Located in the best, safest, cleanest and funniest neighbourhood of Santiago. In the surroundings you will find many alternatives to move, either by subway or bus, and also offices for buying interprovincial-bus tickets or plane tickets. Two blocks from Manuel Montt street, where you may find a very interesting, diverse and entertaining offering in Bars, Pubs and Restaurants. Andes Hostel is a new and fun alternative when staying in Santiago. Located in the most cosmopolitan area of the city, Andes Hostel is a new hostel, so you'll find everything in perfect condition, and specially designed for your comfort.